$850.00 Prussian Heavy Cavalry Sword, 1899-1914, with original steel scabbard. $3,500.00 M 1890 Imperial German Navy dagger, early issue with a miniature U-boat badge probably added by the original owner during WW1. Complete with scabbard and portepee, a beautiful piece with genuine ivory grip and etched blade. $1,950.00 WWI era German Naval Officer's Sword with Ivory handle and magnificent etched blade. This extremely elegant weapon is in excellent condition. $435.00 Imperial Prussian Infantry Officer's Sword 33.5" blade. $575.00 Imperial German Army helmet, with liner. Green factory issue paint. Very good condition. $495.00 Kriegsmarine foul weather pants, in grey leather as worn by U-boat crew. In excellent condition. $1,250.00 Luftwaffe issue electrically heated suede gloves. 1943 dated matching pair in unissued condition. $125.00 Rare Wehrmacht Propagandakompanie Officer's Collar Litzen. Matching pair. $80.00 WH Medical Officer's Collar Litzen. Matching pair. Mint condition. $68.00 WH officer's cap eagle, in bullion. Early light color backing. $25.00 Wehrmacht Gebirgsjager Bevo Edelweiss sleeve insignia. Mint, unissued condition. $650.00 Allgemeine SS cufftitle, Standarte #7 Officer version in silver bullion on rayon ribbon, with both gummed paper RZM labels intact. Unissued. 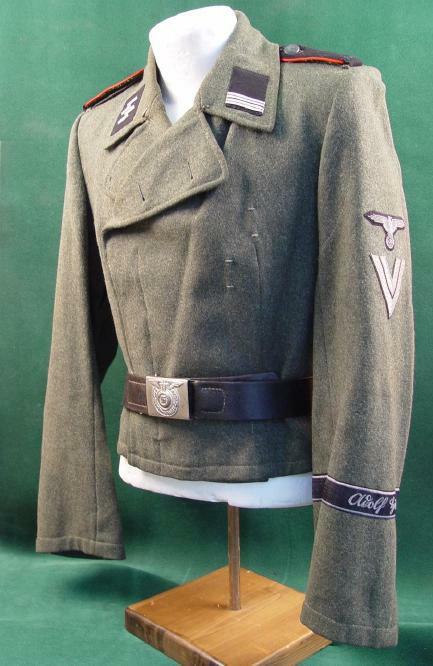 $695.00 Allgemeine SS cufftitle, Standarte #9 Officer version. Mint, unissued. $1,270.00 SS or SA standard bearer's parade gorget, RZM marked to the reverse. Complete item in excellent condition with surface wear and light age only.